Beijing Tianrun New Energy Investment Company (Tianrun) is a wholly-owned subsidiary of the world’s largest wind turbine manufacturer – GoldWind. They’re committed to establishing a platform for technologies, engineering, production, sales and operations for the wind power industry, and to become the world’s leading innovative and integrative service provider for clean energy. The expectation that Tianrun will operate more than 10GW (installed capacity) of wind power assets by 2020. The potential for Tianrun to expand their business in wind asset management for other third-party clients in China and overseas. Addressing identified gaps between their current operational platform and desired platform, including international best practice. Changing regulations towards the energy spot market in China which also brings new challenges to wind power generation companies. Tianrun sought a partner to help them adapt their business to these challenges, as well as improve their operational efficiency. Advisian – our global consulting firm – was engaged to support Tianrun through an Asset Management and Digital Consultancy service agreement. With extensive wind power engineering, delivery, asset operation and management experience, coupled with Advisian Digital’s digitization capabilities, Advisian will support them to enhance their wind asset management efficiency and improve their current digital platform of operations. 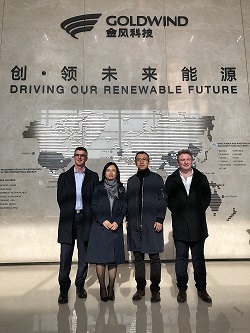 A three-day workshop was conducted in Beijing (8-10 November 2018) with Tianrun’s management and technical team, facilitated by Australian asset management, electricity transaction and wind power operation experts. Current challenges and opportunities were identified, with high-level improvement initiatives agreed upon which will need to be implemented to achieve Tianrun’s desired results. About WorleyParsons: WorleyParsons delivers projects, provides expertise in engineering, procurement and construction and offers a wide range of consulting and advisory services. We cover the full lifecycle, from creating new assets to sustaining and enhancing operating assets, in the hydrocarbons, mineral, metals, chemicals, power and infrastructure sectors. Our resources and energy are focused on responding to and meeting the needs of our customers over the long term and thereby creating value for our shareholders. WorleyParsons is listed on the Australian Securities Exchange [ASX:WOR]. Follow us on Facebook, Twitter, LinkedIn and YouTube.